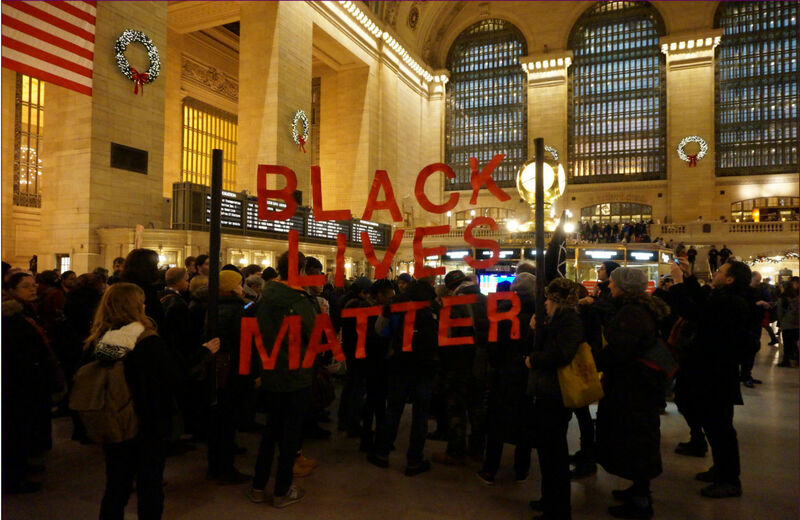 At Grand Central Terminal, Michael Jordan’s Steakhouse is the lookout of choice when the police monitor #BlackLivesMatter demonstrators. This past season in the NBA has seen an unprecedented level of political expression by players, prodded and provoked to speak out and align themselves with the #BlackLivesMatter movement against police violence. The reason players from LeBron and Derrick Rose to David West and Nik Stauskas went public with their solidarity was because a mass in the streets—and on social media—was both loud and powerful enough to enter their rarified air. Is this a fair assessment of the situation, or more a case of “If the Jordan Dub Zero fits”? My Nation colleague James Kelly and I have been trying… and trying to find out whether the use by police of the Grand Central restaurant that bears his name was something that would require Jordan’s approval. In other words, how complicit is Jordan in this process? What we learned is in many ways almost as disturbing than the notion that Michael Jordan wants his steakhouses to be a strategic masthead against the #BlackLivesMatter movement. Let’s start with Grand Central Station itself. I grew up in New York City and always assumed it was public, City-owned space. It is actually owned by a private real estate concern called Argent Ventures. The MTA pays in excess of $2 million annually to run trains through the facility. As for the Michael Jordan Steakhouse, it operates as a high-end franchise, with the one on the north balcony of Grand Central owned by the Glazier Group, namely Penny and Peter Glazier. According to The New York Times, the financial arrangement between Michael Jordan and the Glaziers is not for public consumption. I don’t believe that Michael Jordan, the human being, gave any kind of OK to the MTA or the NYPD to use the steakhouse that bears his name for surveillance purposes. I don’t even think the Glaziers gave any kind of explicit permission to the police, because it is highly doubtful that they were asked. The police in the New York City of 2015 go where they want to go. But I do know that Michael Jordan should care about what happens under his name. If Jordan put out a statement that he does not want police using his restaurants as surveillance hotspots for Black Lives Matter protests, I bet they would be looking for a new location mighty quick. It is not just that it’s a “bad look.” To allow the Michael Jordan Steakhouse to be Surveillance HQ is a slap in the face to every NBA player that risked their brand appeal, commercial viability and incurring the wrath of their fans by standing with this movement. Jordan was never the best of teammates. But perhaps as an owner he should care whether the new generation of players wonders whether he believes that their lives matter.